Recently I rejoined a demographic that I had abandoned a decade and a half ago. I would like to say that it was a political decision to leave that class of society, but truth be told it was largely to conserve personal resources. But once again I am among those persons…automobile operators. This is not to say that I am abandoning the bicycle faithful, but rather that I am using the automobile as a method to expand my cycling options. If every ride of interest started but a mile or so from my front door, what need would I have for a vehicle? Of course, there are some people who appreciate when I show up to dates and am neither sweating profusely nor wearing cartoonish shoes, but let’s set aside such vulgarities and concentrate on transporting bikes with cars. Behold the HoldUp from Yakima. 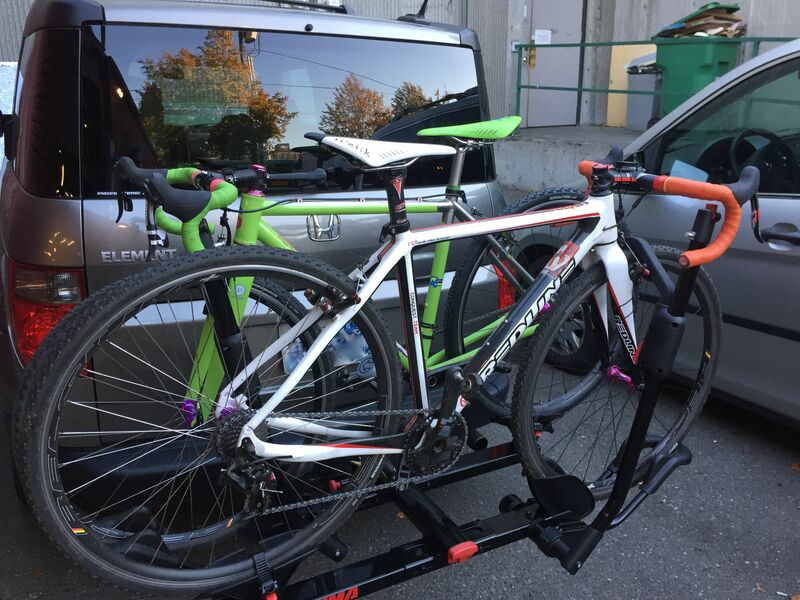 The $449 HoldUp is a hitch-mounted rack from Yakima that carries two bicycles steadied by support arms that grab onto the front tyre. Rather than a long tray, the bikes sit upon a cross beam with a wheel cup at either end. 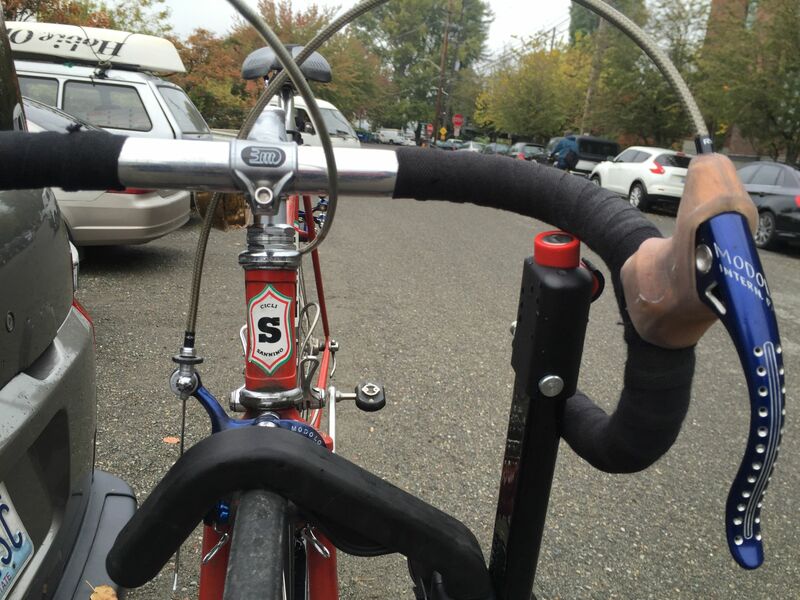 The cup for the front wheel has tubular steel hoop that swings out to catch the forward portion of the wheel; then the “StrongArm” support locks down atop the wheel for a firm grip of the front end of the bike. The rear wheel is held fast by a simple ratchet strap. Securing a bike in place is really fast, and the bike stays reassuringly stable. How stable? That’s a good question, but I can only say that the HoldUp limits are well beyond what I can comfortably subject the beat-down rear struts of my Honda Element. This might be due to the 2” receiver size for the hitch, but I don’t know if the 1-1/4” receiver model would be any less steady. 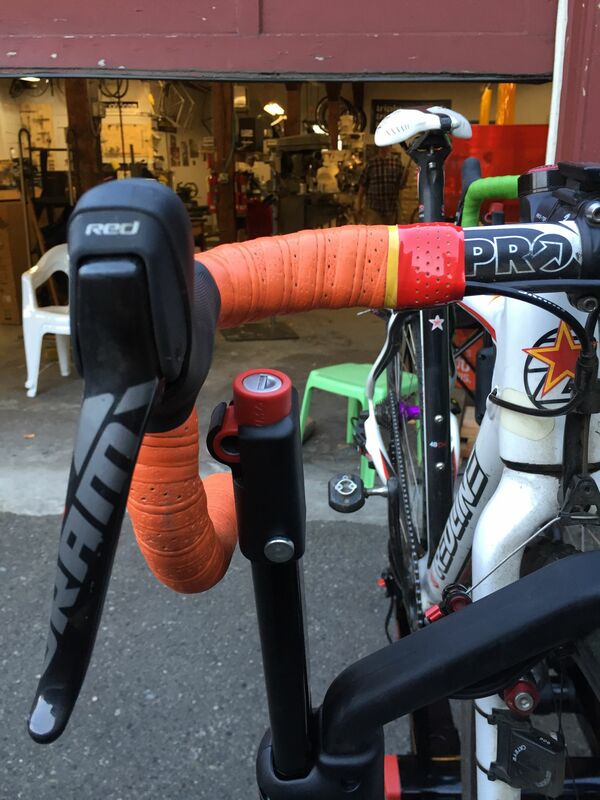 The HoldUp has been a godsend for cyclocross season, mainly because I have intermittent OCD issues. Cleanliness is so very mentally soothing to me, but as a bike mechanic there is no way everything in my life can be cleaned and remain so. I have to pick my battlefields carefully, and I want the interior of my automobile to remain clean. Anything that touches a post-race cyclocross bike gets dirty, so the HoldUp is beyond convenient. I mean, of course I could put my race bike and those of my race buddies inside the small SUV, but that would needlessly drag in all the clods of mud and grass. And I can just slam those filthy bikes into the HoldUp, rather than fiddle with the elastic straps and whatnot of racks that hang bikes by their top tube. 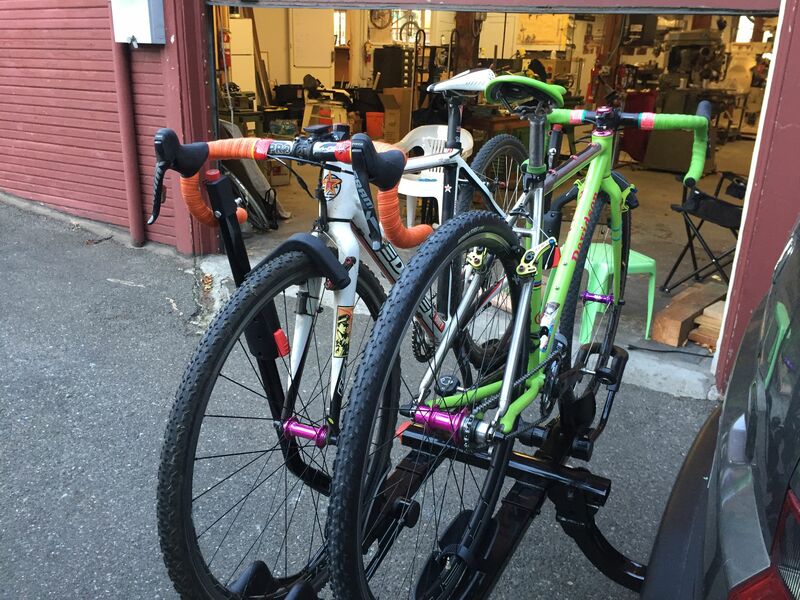 True, there are other racks that can easily mount up four bikes compared to the HoldUp’s two, but those either don’t hold them as safely and securely or stick WAY behind the vehicle. To tell you the truth, I am slightly uncomfortable with the additional vehicle length created by the HoldUp. I learned to drive in the cultural backwater which is the state of Florida. By age sixteen, I was drifting cars before drifting was cool, but I never had to parallel park since parking spaces are bountiful in the suburban/strip mall landscape of Florida. To this day I just don’t have a good feel for where the rear end of my automobile is when I’m backing up, and the HoldUp doesn’t make me feel anymore at ease, especially when the value of the bikes it holds might exceed that of the four-wheeled vehicles involved. There’s been no incident yet, but my parallel parking with the HoldUp deployed must be painful to watch. On the other hand, the HoldUp does eliminate the Greek tragedy of roof-mount bike racks: running into a low ceiling (typically a car park or private garage) with a roof full of expensive bikes. Also, with the HoldUp placing the bikes behind the vehicle, the bikes are considerably shielded in the slipstream of the automobile. Rain water isn’t being driven into the bearings at 70mph, and if I were still in Florida then lovebug season would not see arthropod corpses impact welded to the bikes’ finish. If I ever do graduate to full mastery of parallel parking Yakima do offer the HoldUp +2 as a two-bike extension ($329). There are a couple other issues with the HoldUp. The presence of the HoldUp at the rear of the Honda Element means that I cannot dump the tailgate down without it hitting something on the rack. Obviously I can’t open it when there are bikes present, but I also can’t open it all the way even with the rack empty and folded down. The tailgate rests on the plastic wheel cups, rather than metal on metal, so I can still easily access the rear storage of the automobile but I can’t stand or sit on the gate like I normally would. A Honda Element’s rear window flips up, and at least for my size bikes with dropbars, I can open the rear window with bikes in the HoldUp. Since there are a lot of spatial variables involved, others may find that the HoldUp may or may not affect rear access to their specific automobiles. The other issue is that the HoldUp’s owner manual clearly states the “StrongArm” support bracket is not suitable for bikes that have a front rack or fender, since it must firmly pull the front wheel down into the wheel cup and bracket. I have also found that the low-positioned and distinctly narrow width handlebars (like the 36cm c-c bars slammed low on my 49cm track and road frames) don’t allow enough space to fit the StrongArm between the wheel and handlebar. On most bikes, this wouldn’t even remotely be a problem, and almost no one else has bikes as narrow and low on the front like mine. However, there do seem to be an awful lot of people who are buying fatbikes, and the HoldUp is probably not the rack for them since the StrongArm’s v-shaped hook may be too acute for when the tyres are ludicrously bulbous. 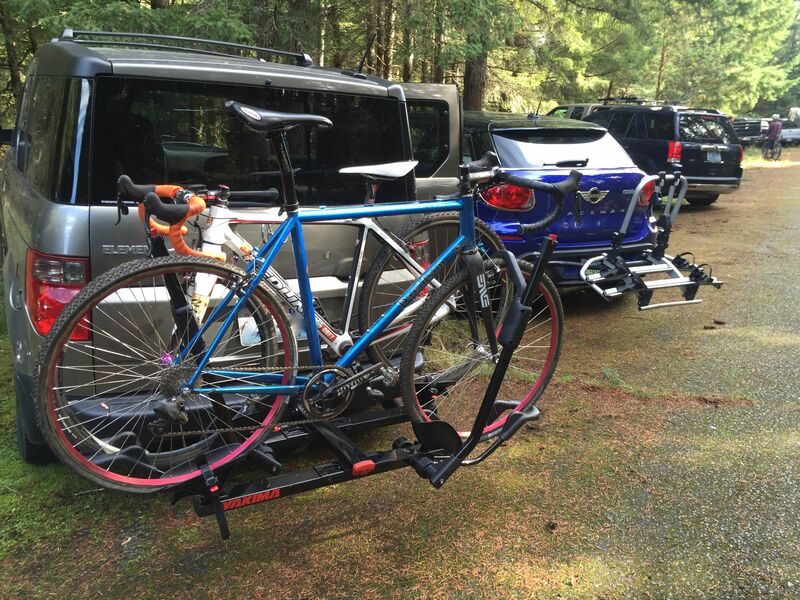 Yakima’s TwoTimer hitch rack is better suited for that, since it’s support brackets holds the top tube down rather than the wheel. For whatever reason, the HoldUp has a higher load capacity than the TwoTimer (120-lbs vs 90-llbs).